Our trip to Japan was marked by hunger and sweat, but we also had the opportunity to live many unforgettable moments. We had the opportunity to spend time roaming around free monkeys (I know, we always meet monkeys everywhere we go, we love them), have a nice walk and enjoy the views. First of all, even if it was really (believe me when I say it) hot, we didn't mind walking our way up the hill. If you like hiking you can't miss this easy but pleasant nature trail. 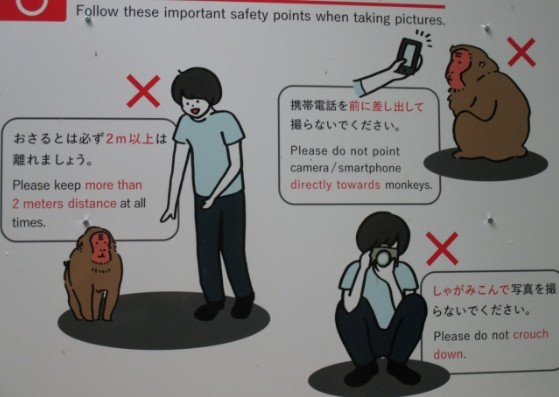 Along the path you'll find some advice and information about the monkeys in sweet typical Japanese manga style . The best part about climbing up a hill is the view of the surroundings from above. 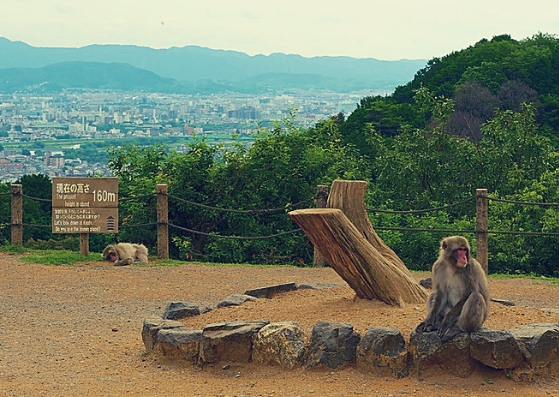 Arashiyama Monkey Park is not an exception. The fatigue of hiking disappear once you reach the top, where the air is a bit fresher and you can restore both body and mind, take some good pictures...band finally meet the monkeys!! 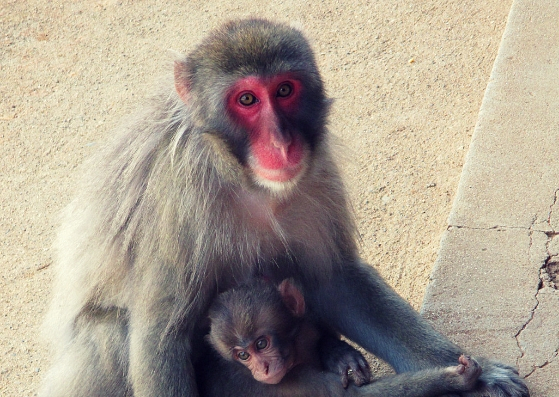 As I mentioned before, we love monkeys, we travel everywhere especially to see wildlife, and these cute animals are our favourite. Here in Arashiyama you can see some of them during the hiking but the huge population resides on the top of the hill ,where they like to bath in the little lake. Once you get there, you can watch them leaping from the rocks and swim, it's so cool! 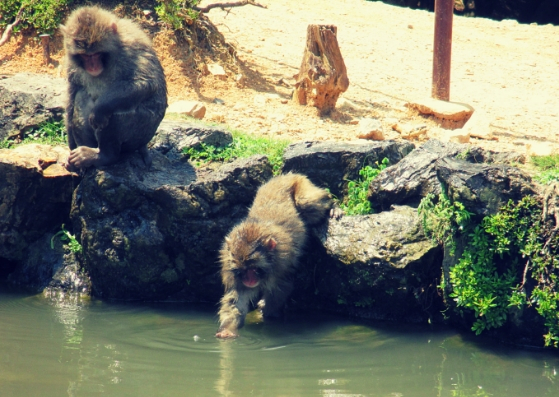 Arashiyama Monkey Park is a place where monkeys are protected in their environment, you can't pet them and you can only feed them from a special little house: you can go inside, buy some peanuts and give them to the monkeys from a grid. In other words...You will be inside a "cage" and the monkeys will be free to come and take your food if they feel like it. It is not permitted to feed them outside but you may get pretty close to them anyway. You can easily reach Arashiyama from Kyoto both by train and by bus. Bus: many lines connect Arashiyama with several parts of Kyoto, however, it is recommended to access the city by train to avoid the risk of getting stuck in traffic. To access the park we had to buy a ticket for around 550 yen, but that was in 2016.